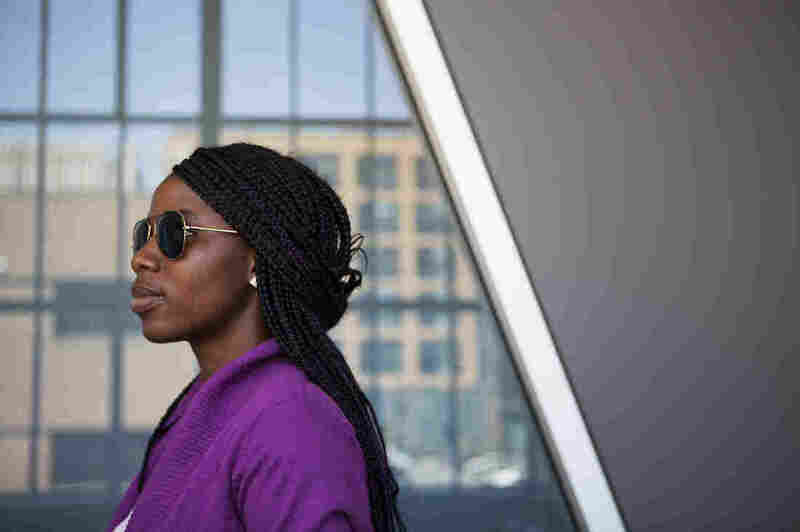 From Boko Haram Captive To U.S. College Student : Parallels She was taken by the Nigerian extremist group when it seized more than 250 schoolgirls in 2014. She escaped in the forest, is now studying in the U.S. — and praying for friends still held captive. Sa'a, a pseudonym she uses for her safety, poses for a photo after an interview with NPR. She was one of more than 250 girls kidnapped in Nigeria by Boko Haram in 2014. Sa'a, 20, escaped by jumping off a moving truck. She began studying at a college in the U.S. in January. Boko Haram drew worldwide condemnation two years ago when the Nigerian extremist group kidnapped more than 250 girls from a school in Chibok, in northeastern Nigeria. To this day, most of the girls are still missing. Last week, CNN aired a video purportedly showing several of them alive. A few of the girls managed to escape — including 20-year-old Sa'a, a pseudonym she uses to protect herself. Last week she spoke with members of Congress, renewing calls for the United States to support Nigeria in the fight against Boko Haram. Sa'a is pseudonym she uses for her safety. She's now a college student in the U.S., though she's not disclosing the school. She shared her story with All Things Considered host Kelly McEvers. Take us back to that night in 2014. Tell us briefly what happened. On 14th of April 2014 the Boko Haram came to my school at Chibok when we were all sleeping at night and they were shooting guns and yelling. And we all wake up and came out of our rooms. We were wearing our pajamas. And when they came in, they keep asking questions that we didn't even know the answers to. Where are the boys? The boys are day students, came to school in the morning and go home after school. And they ask where food is kept. They point out two girls out of all of us and they point out where the food is and put it in a truck. And they move us from where we are staying to the class area and then they start burning everything — our clothes, our books, everything in our school. They ask us to enter the trucks and if not they are going to shoot all of us. We are all scared so we enter the truck and they start moving with us in the forest. When we are driving in the forest I just had this feeling I should try and escape because I don't know where I'm going and my parents don't know where I'm going. And I say to one of my friends that I'm going to jump out of the truck. I would rather die and my parents will see my body and bury it than to go with the Boko Haram. So she said, "OK," she's going to jump out with me. And I said, "OK." I jumped out first and she jumped after me and we hid in the forest while the cars pass. We were just in that forest that night without knowing what to do. It's dark. We don't know where we are. My friend injured both of her legs. She couldn't walk. We just sit under a tree until morning. She has been crying and said I should go home and let her die in forest and I said, "No. If we are going to die, we are going to die together. I won't leave you here." So I go look for help in forest. I was going around not far from where we slept and I found a shepherd. So I ask him for help and he said, "No," he can't help us. But I tried and convinced him. He helped us and took my friend on his bicycle and took us to Chibok and that's we found our help to go home. What happened when you went home? When she got home they took her to the hospital and she got treated and now she's feeling better. She's walking. She's fine now. She told them if they are giving her a scholarship to come and study, she's not coming to school without me because I was the one that helped her. And I told her I'm not coming to school because I am so scared because of what happened. I feel like if we go to school again they are going to kidnap us wherever we are. My brothers and friends encouraged me that I should not let Boko Haram stop me from getting an education. I should be strong and come. I'm here today. I started college in January. I want to study medicine. If you could talk to girls who are still with Boko Haram what would you tell them? I wish I could do that. The only thing I would tell them is to hold onto their faith and let them trust in God. I want to tell them how much we miss them. We are praying for them. We are doing all we can to try our best and see that the government and someone will help and rescue those girls.